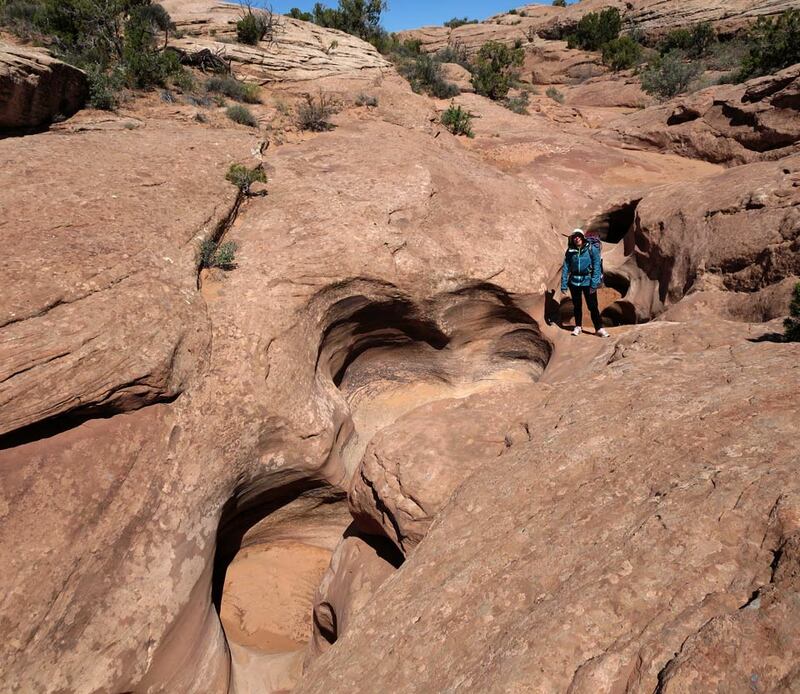 We are setting out on our version of the Hayduke Trail, a wonderful hiking and scrambling route that winds its way through the canyons and plateau of southern Utah and northern Arizona. We have lots of alternates planned from the published version but hope to follow the general spirit of the trail and seek out some wild, beautiful territory! 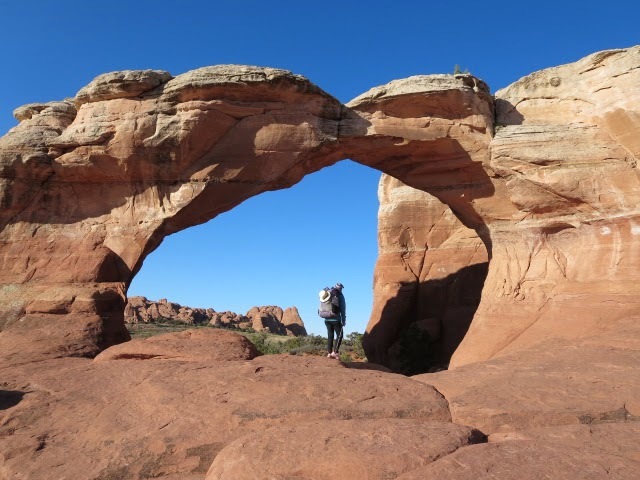 The first part of our route is through Arches National Park and, as we are intending to rent kayaks for the next section and have to stick to a schedule, we find ourselves with a leisurely three days to do this part of the route. 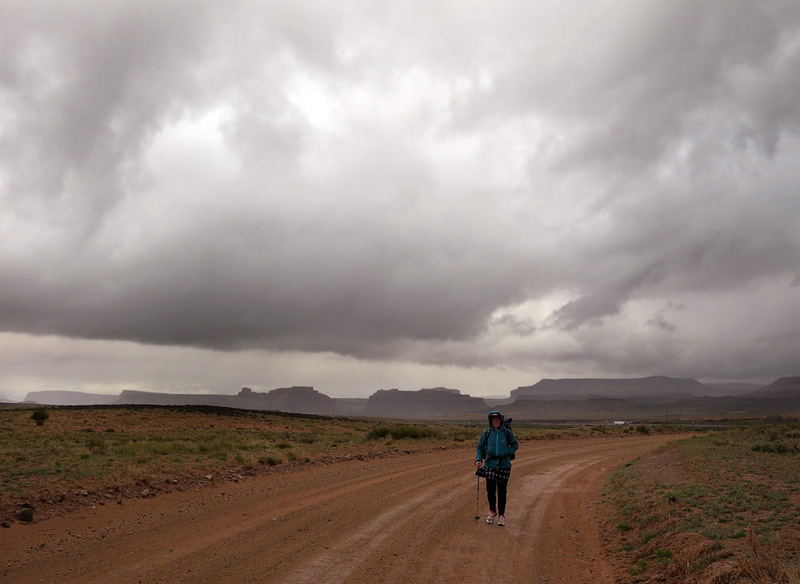 It rained hard on Sunday April 13th as we tried to hitch from Moab to our planned start point 18 miles to the north. After getting soaked at the side of the road we retreated to the ‘Sweet Cravings’ cafe to regroup! 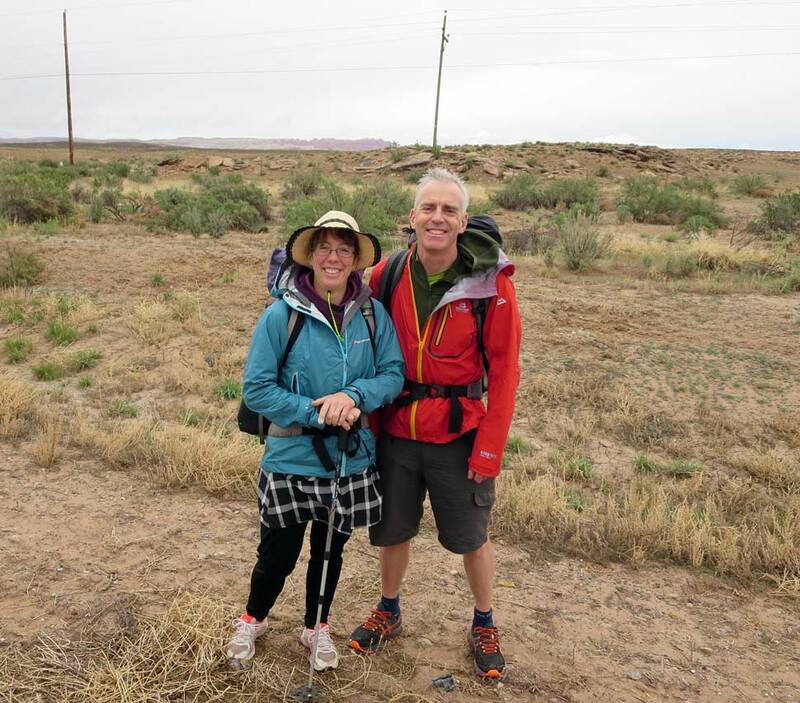 Luckily for us fellow Scots Mathew and John from Largs (thanks guys, and enjoy the rest of your holiday) gave us a lift to the Klondike Bluffs junction near Moab airport and we started our hike in driving rain across the sage brush plains. We headed north east on dirt road in the rain for about 3.5 miles to a trailhead possibly used by mountain bikers. From here we headed out east cross country over washes and rising sandstone slabs. This was great and what we had traveled from Scotland for! We aimed for the ‘Marching Men’ tower formation on the horizon and the sky gradually cleared as we reached Tower Arch in Arches National Park. 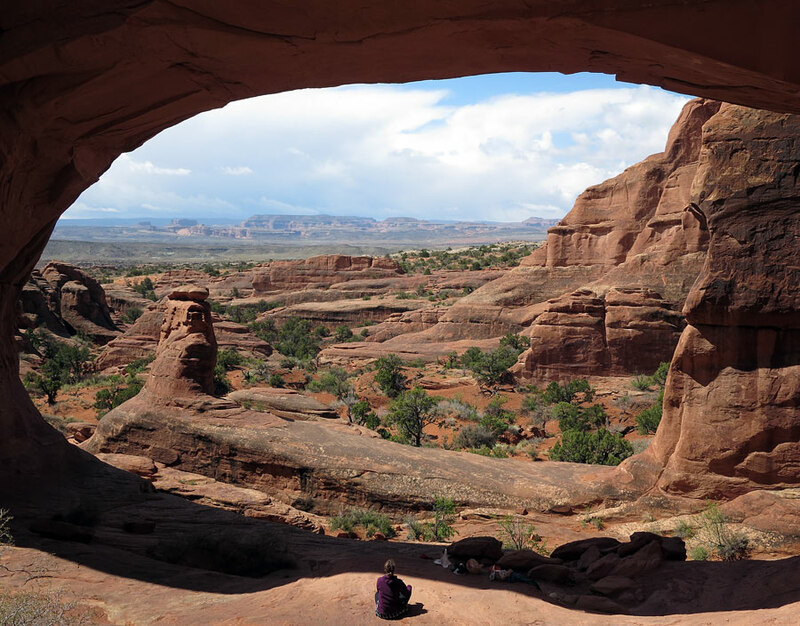 Sitting under the arch we looked out to a magnificent canyon view framed by the arch itself. 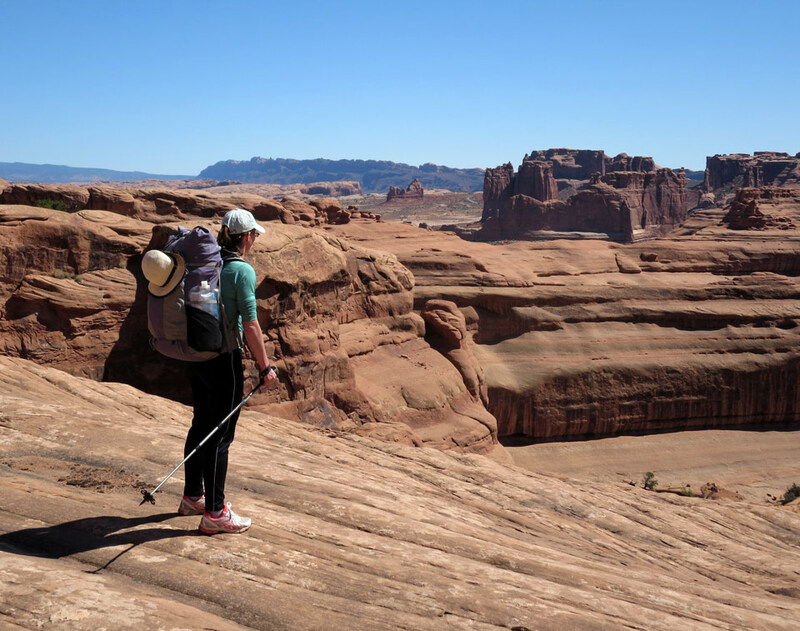 From Tower Arch we followed a cairned trail winding through sandstone towers, then a jeep trail into the wide open Salt Wash. Here we crossed the Hayduke trail to head out again on an alternate north east. We had our first scramble up a cliff band towards Dark Angel tower and vast open views all around. Now on proper trail we took the Primitive Loop through the Devil’s Garden area of Arches NP through its labyrinth of vertical fins and gullys. A superb start to our journey! We camped at Devils Garden and got hit by freezing cold wind and rain….long may it continue as we know that heat will be our enemy later on this hike rather than cold. Our sleep was broken during the night caused by us needing to get out to move and repitch the tent after a large puddle formed underneath. Next morning we awoke to clear blue sky and frozen puddles around the tent. Firstly we did a wee extra hike around Broken and Sandy Arches which were fantastic. Crossing the Arches NP road, we then headed cross country south west to aim for the Hayduke trail again. Both of us wore all our clothing to keep out a biting cold wind on this exposed stretch but views opened out to the La Sal mountains covered with fresh snow. Our mid morning break was taken sheltering from the wind beside a rock fin before we climbed up to a fence line forming the park’s western boundary. Back on the Hayduke, we crossed country south, weaving on sand between bushes and cacti before arriving at a semi circular slab dropping below us. A scramble down this led to Willow Spring wash and it was heartening to see some water in potholes in the slabs. 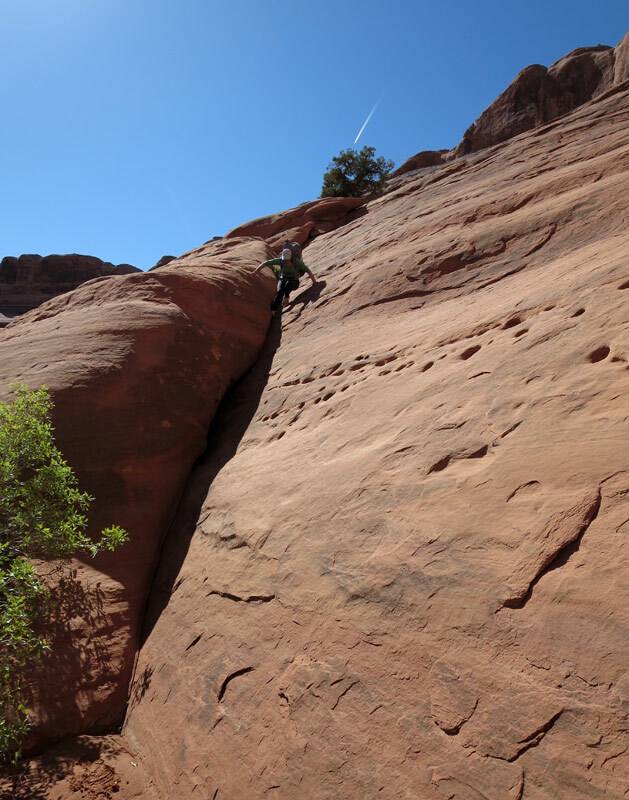 The wash was left further down to allow us onto the slabby plateau following a route described by Nicolas C. Barth called Arches Slickrock. This provided a great hike with expansive views to the La Sal mountains to the south east, still with a spring snow cover. A sea of grainy, ripply slick rock interspersed with sandy joints, juniper, cactus undulates but it was easy going. Arriving above Courthouse Towers we looked down into a slightly intimidating great amphitheater of rock. The first step down was easy followed by a traverse rightwards along a slabby ledge. We then scrabbled down slightly slippy, grainy slabs using our 3mm cord to lower the backpacks a short way from a juniper tree. Then down a chimney crack back into a sandy wash- phew that was interesting! We found the main Courthouse wash valley and followed that for a while through vegetation crossing the park road again. Pools of water here and signs of beaver activity in the wash. There was a faint path and we stayed dry as there are logs handily spanning the pools. Our tent was pitched on a small patch of grass in the canyon next to the river under cottonwood trees. A superb day! A crisp frosty morning but the sun was up quickly and we were able to lay the tent out to dry before moving off. 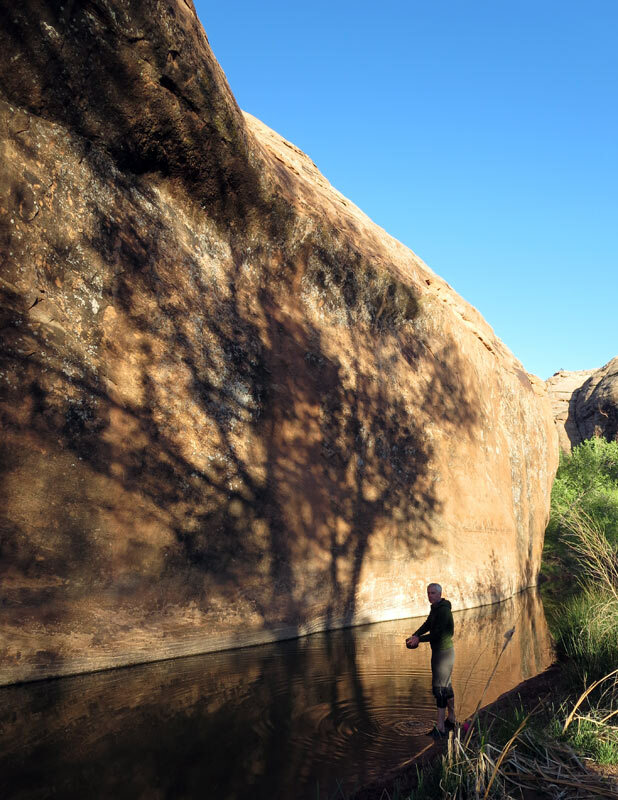 The canyon is not narrow, generally about 50-100m wide, with red walls and shimmering green cottonwoods with mild breezes and the trickle of water- it is beautiful. We see what look like raccoon tracks in the mud and enjoy our easy walk downstream before breaking out onto the road into Moab. Our first crossing of the mighty Colorado river is by footbridge and then we hiked on by road into the town of Moab. We had some logistics to sort out for our next long stretch and enjoy the luxury of a motel for the night – the Adventure Inn. Moab is a great vibrant town…but it was a bit weird as it is ‘Jeep week’ and the town is packed full of the strangest looking ‘souped up’ Jeeps! Tomorrow we pick up kayaks for 70 miles paddling down the Colorado followed by 65 miles hiking. 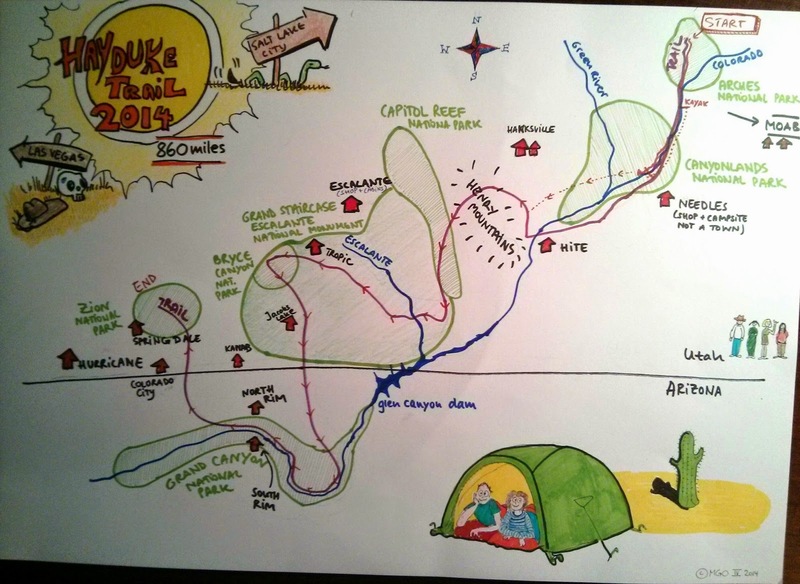 Next stop Hanksville, Utah in 9 days …. Safe journey on the kayaks Guys. Bet that water will be cold getting in and out! Not to cold but very muddy. Ended up caked in silt after the kayak. Was wonderful though and very relaxing…. Just drift down river and paddle occasionally… I recommend it! Just arrived in Hanksville pop. 219 after 9 days out And will post after shower and food!!! !